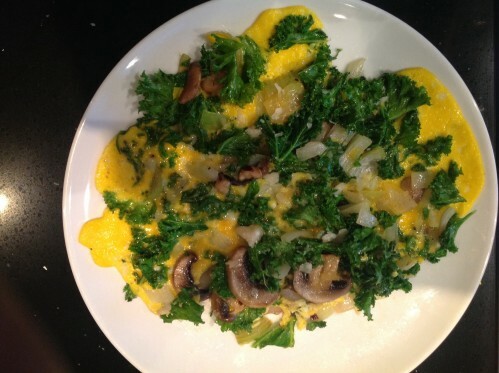 Here we have another frittata idea for breakfast or for any meal. In this one we have onions, kale and mushrooms, but you can add whatever other ingredients that you like. Eating a frittata will get you away from choosing that bad cereal or the quick 2 pieces of toast that will only satisfy you for until the eleven am coffee break. Beat 2 eggs in a jug, then add them to the mixture evenly. Add some butter and grated Parmesan cheese (optional). When the frittata becomes solid, serve and eat.